There are over 40 000 named species of mite, and if estimates for unnamed species are included, then up to 1 million may grace the planet. By comparison, there are approximately 40 000 species of vertebrates, half of them fish, alive today. Mites are predators, parasites, herbivores and detritivores. They live in the dark depths of the ocean, in the lungs of birds, on the leaves of rainforest plants, and in human clothes and bedding. They are vectors of disease, vital players in soil formation, and important agents of biological control. Despite the grand diversity of mites, these small arthropods are often overlooked, and even trained biologists can be unaware of their significance. This books aims to fill the gap in our understanding of these intriguing creatures. It surveys life cycles, feeding behaviour, reproductive biology and host-associations of mites, without requiring prior knowledge of their morphology or taxonomy. The text is richly illustrated with line drawings and photographs. 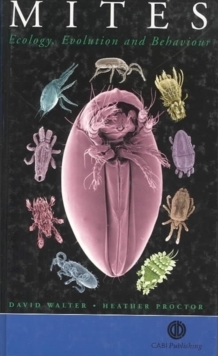 Topics covered include evolution of mites and other arachnids, mites in soil and water, mites on plants and animals, sperm transfer and reproduction, and mites as models of ecological and evolutionary theories.